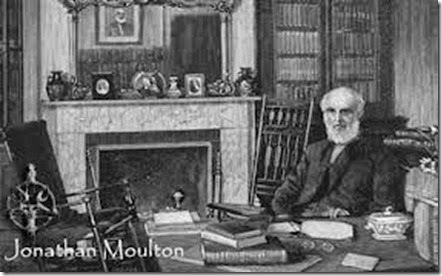 Did General Moulton Really Sell His Soul? There is an old story about Brigadier General Jonathan Mouton, an officer in the Union Army under George Washington, who amassed a fortune during his years in the colonies but then died a sudden and terrible death because he sold his soul to the devil, and then attempted to cheat the devil during a delivery of gold coins. General Mouton accomplished rather amazing things during his lifetime, he did amass a fortune, and then lost everything when his mansion in Hampton caught fire and burned to the ground. The legend that has endured about Mouton is that he made a strange pact with the devil; that he would deliver his soul if the devil would fill his boots with gold every month. But Mouton was greedy like many wealthy people. He bought the largest size in boots he could find and then cut off the toes so excess gold coins would accumulate each month.The extra coins were hidden in the walls of the great mansion that Mouton built. It was not long, however, before the devil discovered Mouton's trick. In his anger it was said he caused the fire that destroyed the mansion and melted all of the gold. Mouton's mansion was, indeed, destroyed by a major fire in 1762. While legend has it that Mouton died in the fire, historians say this is not true. He lived another 25 years, managed to rebuild his mansion and raise a family. It was during the night of the wedding of his daughter, Nancy, in 1787, that Mouton was discovered lying dead in his garden. He was 71. As the legend is told, the second great house, which still stands, was haunted by Mouton's spirit who was looking for his lost gold. More recent occupants of the house, however, say they had not detected any sign of Mouton's ghostly presence. There is yet another spooky part of the Mouton legend. At the time of his funeral some of the pallbearers dared to lift the lid of his coffin. Inside they found that his body was missing. Instead was a box of gold coins all stamped with the imprint of the devil. The people were so shaken by the events surrounding Mouton's death and funeral that it was said the body was buried without a grave marker. To this day the location of his remains are unknown.